We continue our series of blogs that look at The Children’s Society’s Archive’s fascinating collection of 523 fundraising flyers that were distributed as inserts in The Society’s former supporter’s magazine Our Waifs and Strays. 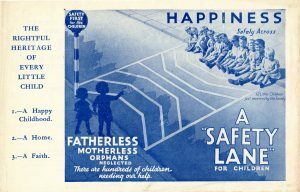 This post written by one of The Children’s Society Archive team, Clare McMurtrie, considers two flyers in the 1930s that feature road safety. 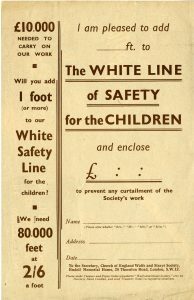 Since The Children Society first opened its doors in 1881 child safety has been at the forefront of the charity’s work. During the 1930s The Society used several road safety campaigns, following the 1934 Road Safety Act, as part of its various fundraising campaigns advertised in the charity’s supporter magazine Our Waifs and Strays. These involved raising money to extend white line road markings across the country, as well as creating pedestrian crossings. In 1934 there were only 2.5 million vehicles on Britain’s roads, with 7,343 killed in road accidents that year . By 2014 the total road deaths had decreased to 1,775, with 35.6 million vehicles licensed in Britain . In the UK, the first “white line” road markings appeared on a number of dangerous bends on the London-Folkestone road at Ashford, Kent, in 1914, and during the 1920s the rise of painted lines on UK roads grew dramatically. In 1926 official guidelines were issued by the Ministry of Transport that defined where and how white lines on roads should be used. 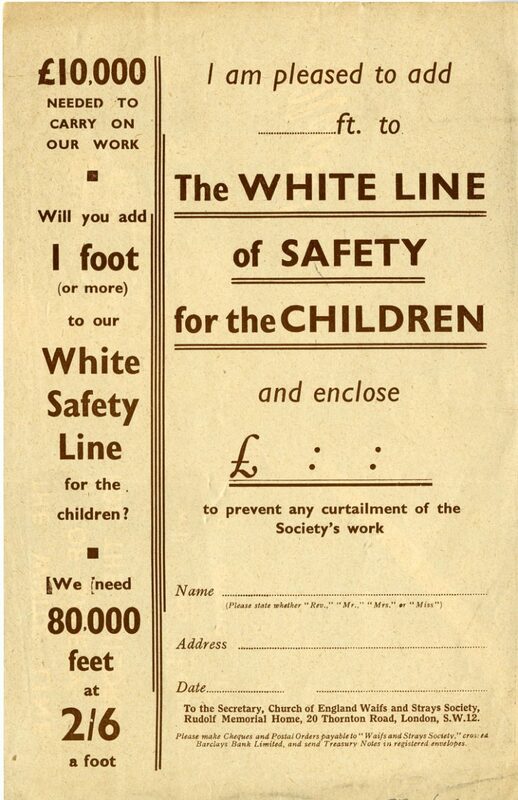 Using the ‘white line of safety’ theme in the flyer depicted here, The Society asked its supporters to donate 2s 6d (12.5p) to add one foot to its own ‘white line of safety’ that provided care for children in need, declaring that the charity wanted to add an extra 80,000 feet to this line – so raising an extra £10,000 “needed to carry on our work”. The black and white stripes on pedestrian crossings are designed to reflect the markings of zebras. In the United Kingdom, zebra markings give pedestrians permanent right of way if accompanied by a belisha beacon or conditional right of way when accompanied by traffic lights. In other countries they are also used on pedestrian crossings controlled by traffic signals, and pedestrians have priority only when the lights show green to pedestrians. In the UK the crossing is marked with Belisha beacons, flashing amber globes on black and white posts on each side of the road, named after Leslie Hore-Belisha, the Minister of Transport, who introduced them in 1934. 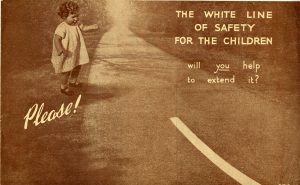 In 1934, The Society used the idea of the newly designed safety lanes and markings for roads, as a fundraising image to depict its work as providing ‘A Safety Lane’ for children, who through the charity’s care could be safely helped across the dangerous road of being parentless and in poverty, to a place of happiness; The Society saw this as being “the rightful heritage of every child”. It is interesting to note that the children in the flyer who are depicted as requiring protection, are standing in the shadow of an urban chimney pot, spiked skyline that casts darkness on their side of the road. 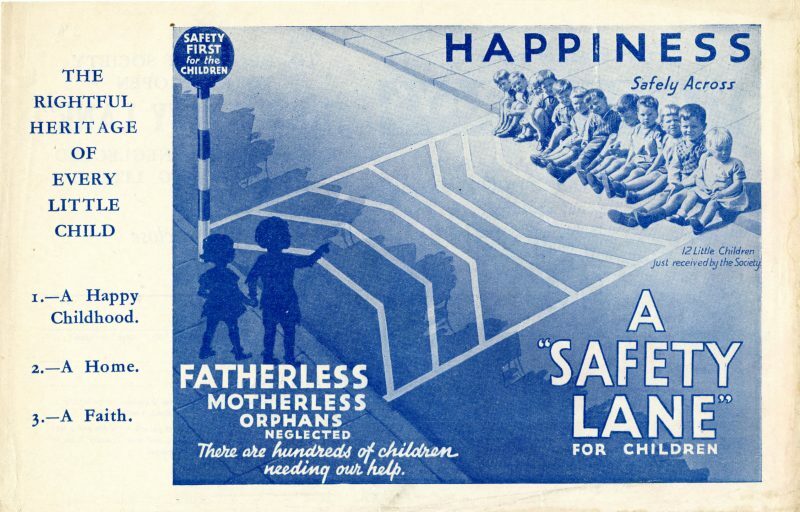 In contrast – and to extend the imagery further – the children on the ‘happiness’ side of the road are sitting in bright sunshine and a place of safety. At the side of the crossing is an early depiction of a Belisha Beacon, whose flashing light announces ‘Safety First for the Children’. Despite the large reduction in road fatalities in Britain since the 1920s and 1930s, the number of child road deaths and serious injuries rose for the first time in 20 years in 2014 . The overall trend has although been increased child road safety, with the introduction of white lines, pedestrian crossings, and compulsory driving tests. This is seen in the massive reduction in both adult and child road fatalities, comparative to the ever increasing traffic on Britain’s roads.